I’ve been having some trouble porting over my Film Journal blog over to this new site, so I’ve decided to occasionally post some of the better (more deserving?) posts here as Archive entries, starting with this post from January 2007…. It has occurred to me that one of the negative effects of the internet and DVD special features has been the demise of quality fantastic film magazines, the likes of Cinefantastique, Starlog, Fantastic Films, Starburst, Cinefex. While some magazines are still being published, most have gone and those that remain are pale shadows of their past incarnations. The Golden Age was really back in the late ’seventies, early ‘eighties. Back then, Cinefantastique, the grandest of them all, was in its prime. This was an astonishing magazine, with luxurious presentation for its day, and some of the finest specialist journalism. It was a truly authoritative publication- some of its articles have been unmatched to this day. Its in-depth, 40+page articles on the likes of FORBIDDEN PLANET, 20,000 LEAGUES UNDER THE SEA, DUNE, CONAN THE BARBARIAN, remain the definitive accounts of the making of the films. Paul Sammon’s article about BLADE RUNNER remained unsurpassed until he himself wrote the book FUTURE NOIR many years later, and it can be argued that the magazines presentation, with rare, never-again published photos, still make that article superior to the later book. In truth it was an exciting time to be a sci-fi fan, as Hollywood tried to capitalize on the success of Star Wars in 1977. Genre films were breaking barriers, and special effects artists were becoming as famous as the directors and actors. Fantastic Films entered publication riding the wave of the sci-fi boom, and while early issues were inferior to Cinefantasique, later it began to catch up in quality. 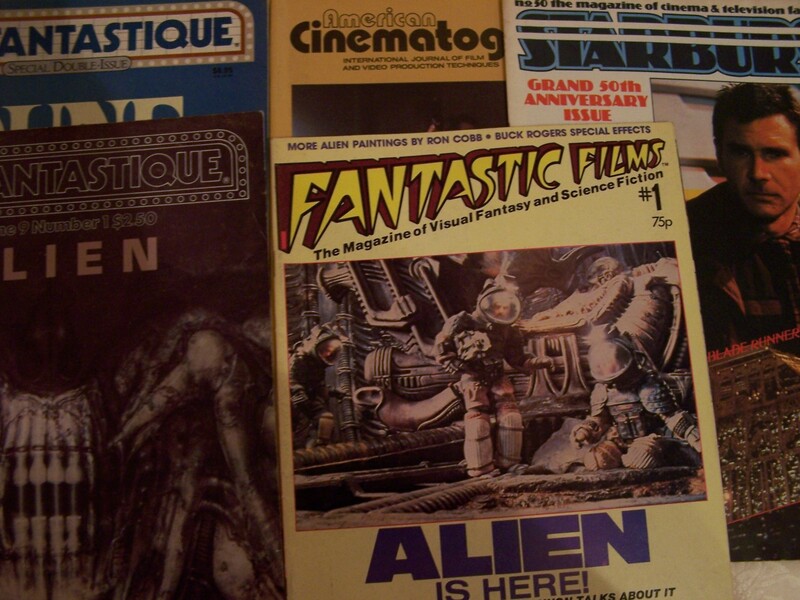 A series of issues of Fantastic Films in 1979 that centered on ALIEN were equal to anything in Cinefantastique- detailed interviews with Dan O’Bannon, Ron Cobb, and, in particular, one with Ridley Scott that was so lengthy it was spread across two issues, were fascinating. These were the days when interviewees were surprisingly honest and candid, and there was little evidence of the stale publicity-junkets that dominate proceedings today. An interview with Robert Wise, while he was making STARTREK:TMP, that covered his career from film to film was a serious and honest appraisal of the master craftsman’s work on genre pictures, with a detail lacking in magazines today. The British magazine Starburst launched in 1977, and while it never ever matched it’s American cousins for graphic quality, it nevertheless had some fine writers working for it, and commissioned some fine interviews. Some of the interviews about BLADE RUNNER actually matched those of Cinefantastique, and a fine review by John Brosnan was quite perceptive and pre-dated some of the critical revaluation that would follow years later. John Brosnan was a guy who vexed many fans who would never forgive him for scathing reviews (I recall one for THE EMPIRE STRIKES BACK in particular, and I’m sure he wrote his reviews deliberately to wind up the fanboys), so to read him praising my favourite film was a real treat back when most of his reviews were extremely critical. It’s tempting to think that the magazines were better back then simply because the films themselves were. Cinefex remains a quality periodical, with serious and detailed articles on special effects, but it isn’t a shadow of it’s old self from the late ’seventies and ‘eighties, mostly because of how films have changed. In its early years Cinefex had great behind-the-scenes photos of gorgeous miniatures being built and photographed, matte paintings being skillfully painted on glass – nowadays the best you can usually get is some guy sitting at a workstation. Interviews used to dwell in detail about optical processes and the design and photography of models and mattes, while today it tends to be dominated by dry anecdotes about software applications. Times have certainly changed, and the marketing and publicity departments for modern blockbusters have, I suspect, far more control of what gets printed these days. Likewise the internet and in particular the special features onDVD special editions make in-depth journalism redundant, unfortunately. But I still maintain that there is a magic to reading an in-depth article in a magazine you physically hold that is superior to what aDVD doc might manage. But alas the Golden Age has passed. The likes of Cinefantastique, Fantastic Films and the glory days of those magazines still in print today have gone and will never be seen again. The internet is a powerful and rewarding library of knowledge, and I enjoy watching the special features on DVDs, but for some fans like myself, neither the internet orDVD will ever replace what we have lost with the demise of those magazines of my youth. Reading them again today is like taking a sad journey on a time machine to better, more exciting days. I must be getting old…! I guess I am too, then, as I liked this piece very much. I interviewed Ron Cobb in the mid-90s and he was a fascinating guy to talk to, a real fount of information about the early days of special effects. One story he told me sticks out: when he was brought in to design some of the creatures for the bar scene in ‘Star Wars’, he arrived at the set only to find it embraced in the atmosphere of a morgue. A nervous assistant told him to quickly draw some alien designs and he obliged. He was ushered into La Lucas’ prescence by the visibly trembling minion who hovered nearby as Cobb showed his drawings one by one to George. Each one was met with a brief, atonal grunt. When he’d displayed his last design, George gave Cobb a brief nod and waved his hand. Convinced he’d bombed, Cobb headed out of the office and closed the door behind him. To his surprise the assistant immediately grabbed his shoulders and shook him, grinning broadly. “That was great!” he said. How very true. I still read my copies of Cinefantastique and early Cinefex. It may be that the same information exists on the interweb but there’s no replacement for opening and devouring the truly comprehensive articles. I’ve a few quibbles, I still think the CFQ coverage of Blade Runner is superior to the Book although I believe Sammon did ‘em both. Ally that coverage with the Cinefex issue and you have amongst the most comprehensive coverage of BR ever. CFQ in its heyday was excellent. But unfortunately it’s demise was long and protracted and I was sorry to hear of the demise of its founder a few years ago. Again, Starburst up until about issue 75 or so was excellent. Brosnan was always an excellent read . His baiting of Star Trek fans was excellent (particularly involving the fictional convention riot with all the attendees wearing Spock ears). And his non-fiction book ‘Future Tense’ was very good indeed. Unfortunately, he also was found dead in his flat a year or two ago. I’d forgotten about ‘Fantastic Films’ – it’s up to the attic tonight. But these are quibbles with the content of the magazines themselves. Thanks for a great read and some great memories. Nat, Phil, thanks for your comments. I hadn’t heard of John Brosnan’s demise. Thats really sad news, I didn’t always agree with his views and his winding-up of the fanboys seemed forced a lot of the time, but he was always an entertaining read. Since writing the above piece I’ve been reading Paul Sammon’s article on DUNE in CFQ. Is it just me or were sci-fi/fantasy films more exciting back then, even the bad ones usually had something going for them? 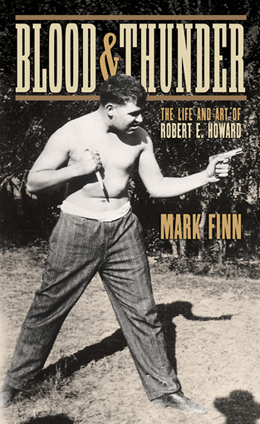 I’m currently reading this second edition of Mark Finn’s biography of pulp writer Robert E Howard, Blood & Thunder. The first edition was published several years back in paperback- this updated edition is in a handsome hardback edition from the wonderful Robert E Howard Foundation Press. The REHFP is a dream come true to REH fans like me who have been reading the great Texans work over the years- the REHFP editions of Howard’s work are frankly extraordinary after decades of buying soon-worn out paperbacks, and have a wealth of previously hard to find material, particularly their Collected Letters volumes and the Collected Poetry book (okay, okay, this means nothing to anyone unfamiliar with Howard’s work, but Howard fans will know what I’m going on about). But anyway, back to Blood & Thunder– I read the earlier (2006, I think) edition and found it a very worthwhile book, albeit with a few reservations. The second major biography of Howard, it follows L Sprague DeCamp’ s rather universally derided Dark Valley Destiny of 1983. REH fans quite rightly howled at the psychosexual innuendo and other problems with that work. To that end, Blood & Thunder balances the scales somewhat by defending Howard and correcting DeCamp’s wild assertions and theories. This second, updated edition of Blood & Thunder is a much-improved piece of work compared to the earlier version, being rather expanded. I’m only a few chapters into it so far, so it’s perhaps unfair for me to go too far here. I still have problems with the prose pieces that serve as fictional intros to each of the fours sections of the book, in which Finn portrays Howard at distinct moments in his life. I didn’t like them in the earlier edition and I still don’t like them here. I can understand why Finn wrote them, but I think the emotional connection might have been as well-established had Finn simply written the sections about himself, say, standing in the Howard home present-day, or in the streets Howard walked in Cross Plains. Or at Howard Days in June, describing other fans there, their thoughts and feelings, before jumping back into the biography. I guess that’s a personal artistic feeling I have regards the structure of the book. Anyway, a proper summation forthcoming when I’ve read it all, but looking pretty good so far. Pre-ordered this Blu-ray from those fine folks at the H. P. Lovecraft Historical Society- impossible to resist, really, having bought their wonderful Call Of Cthulhu film on DVD some years ago. A fan-made movie made for fans of Lovecraft’s work, COC was made in the style of a black and white silent movie, as if it were filmed back when the story was first published in the late 1920s. Strangely authentic is how I’d describe it. The Whisper In Darkness, the latest film from the HPLHS, is based on a tale written in 1931, and has been made in the style of the then-new ‘talking pictures’, similar in approach to the 1930s Universal horror film classics Frankenstein and Dracula, with a bit of 1940s film-noir thrown in, apparently. Reviews for Whisperer, which had screenings last year at festivals etc, have been as positive as those were for COC. Can’t say fairer than that, as COC was possibly the most faithful film adaptation of a Lovecraft story yet. Making these as period movies is sheer genius considering the subject matter of the tales- Hollywood’s attempts to modernise the HPL tales into modern-day settings just doesn’t work. Released on DVD late last year, I’ve been hanging on for this Blu-ray edition, which had been held up by production complications. Looking forward to posting a review here in a month or so. Can hardly wait.